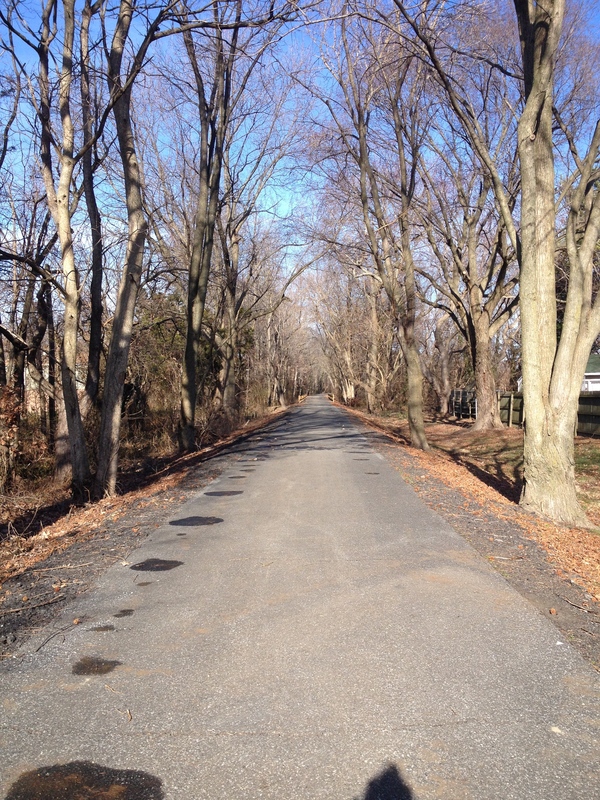 A while ago as I was on a run in Easton, Maryland, I noticed that Easton has a Rails To Trails paved trail. I decided not to run on the trail that time, but I was interested in checking it out at a later point. Then, it took me a decent amount of time to make it back to Easton to run, and to the trail. 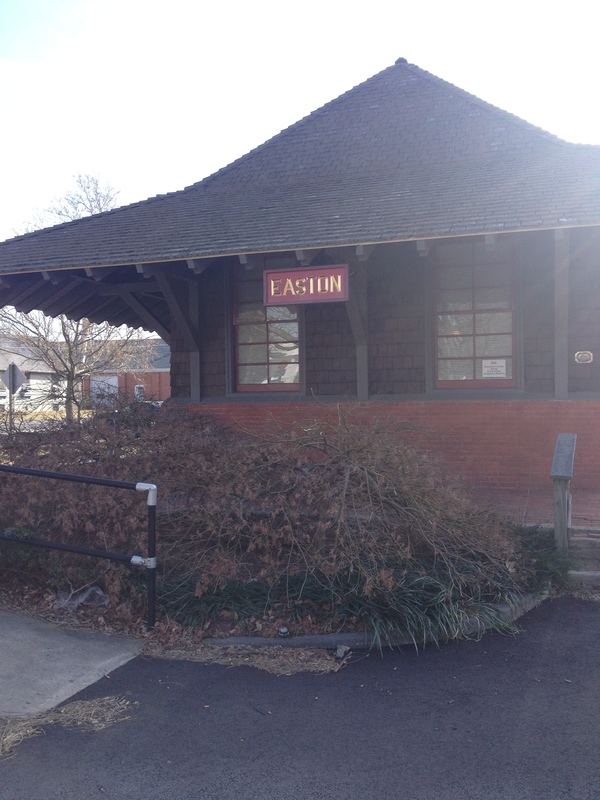 But on my way back from a visit across the bridge on Sunday (for anyone not in Maryland, that’s what we on the Eastern Shore refer to as anything on the other side of the Bay Bridge), I decided I’d have a good opportunity to stop in Easton for a run and explore the trail. I hadn’t looked it up ahead of time recently, so I drove in on Goldsborough Street toward downtown Easton from Route 50, figuring I’d either find the trail or stop somewhere to look it up. It happened that parking for the trail was right off Goldsborough Street. I still looked up the trail and found that it was two-and-a-half miles one-way. I also saw a review that called the trail “a little sketchy,” but I figured I’d run it anyway and if I felt like I was getting into a bad area, I could turn around. I was kind of looking out for things, and to me it didn’t seem to be sketchy. However, it’s probably always safer to bring along a friend. Anyway, I didn’t really need to look up the distance of the trail, as it’s marked in text on the ground how many miles have passed since the end of the trail for both directions. For example, I started where I had about 1.5 miles to go in one direction and 1 mile to go in the other direction. That mile marker would be marked for a mile-and-a-half going my direction, and you can see the marking for one mile going the other way. If you’re interested in checking it out, here’s a trail map. It’s a flat trail. I first went toward the park that’s at the north end of the trail, and went past woodsy areas and saw many exits/entrances to different streets and neighborhoods. The other side of the trail seemed more empty, although I did see some murals on buildings. 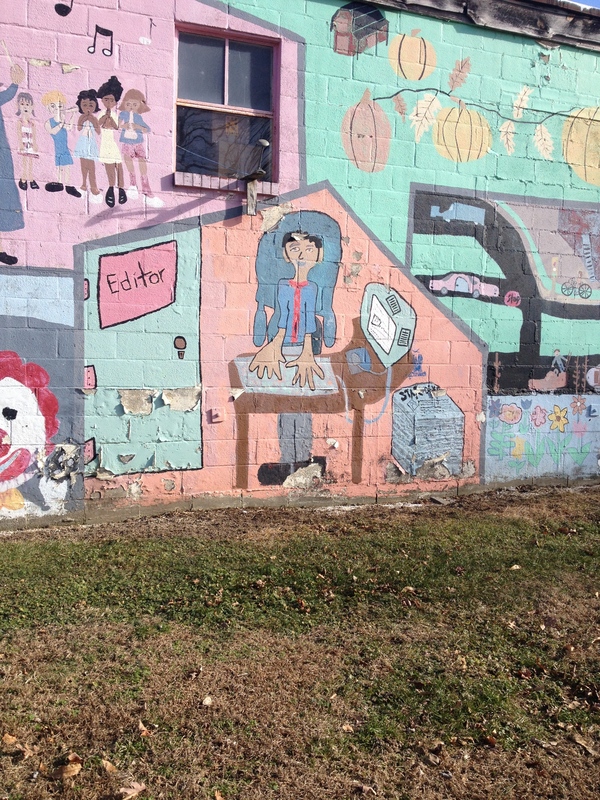 As a newspaper reporter, I particularly was happy to find that a newspaper editor was part of a mural about various parts of the community — health, public safety, and the like. It was a nice change of scenery, and I’m glad I finally got to run there. I ran the whole trail, so I got a 5-mile run in.